Holy %$#@, are these delicious! Get yourself a donut pan and make these today! I will come up with other flavors soon. I am thinking Blueberry Lemon, Raspberry, Peach Coconut- and of course, CHOCOLATE! My silicone pans are apparently NOT non-stick. So, phase 1 versions will have to wait. I have not made these with stevia, or anything other than xylitol. I did try other flours and this is the best combo I have found. 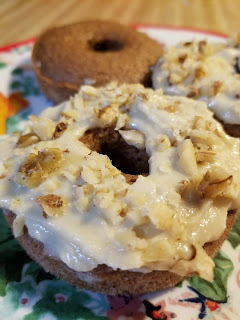 I did try these in a muffin tin and they did not turn out like donuts at all. A donut pan is necessary. Mix milk, egg, vanilla, xylitol and oil together until the xylitol is dissolved. Add spices, salt, xanthan gum, baking powder, and whisk. Add flours and mix well. Batter should be like a thick pancake batter, so add water to get to this, if needed. Oil your pan, and fill each donut cup to the top. Preheat oven to 400. Make sure it is pre-heated. Put pan(s) in oven and turn down to 350. Bake 9-12 minutes, until set. Let cool and remove. What is your frosting? Looks great! Thanks for sharing. I wonder if you can make these in muffin tins? Do you think this batter would work in a baby cakes donut maker?